Henri-Horace Roland de la Porte, who studied with Jean-Baptiste Oudry, is frequently cited as a close follower of Chardin. 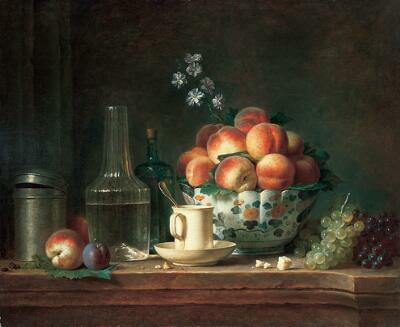 In fact, his brushwork is dryer and more meticulous than Chardin’s. Roland de la Porte did follow his illustrious rival in his choice of everyday objects. The same is true for the light source, which comes from the upper left, and throws the objects into relief as it highlights them against an indistinct background. In his still lifes, he brought the Rococo paradox—the suggestion of extravagance and informality accomplished with meticulous technique—to its zenith. Henri Leroux, Versailles (sale, Paris, Palais Galliéra, 23 March 1968, lot 86, ill., as Nature morte). Many of the objects in this picture—breadcrumbs strewn across the tabletop, a lopsided canister lid at left—may give the impression that the artist has come upon them by chance. In fact, nothing could be further from the truth. The painting is by Henri-Horace Roland de la Porte, one of the most accomplished still-life painters of 18th-century France. He carefully arranged every element, down to the tiniest detail, to create a sense of harmony and balance. Notice how the objects rise on the right and left to create an equilateral triangle, with the sprig of flowers at the very top. Within that triangle, repeated shapes and colors subtly complement one another. For example, the china bowl’s pattern of meandering foliage and pale orange blossoms echoes the peaches, leaves and flowers inside the bowl. In the center, the spoon handle protruding from the cup creates a diagonal line that’s repeated by the flower stem at the top. As for those casually strewn breadcrumbs—notice how the largest one tilts slightly to the right, echoing (in miniature) the angle and shape of the nearby cluster of green grapes. And why do you suppose the shelf curves inward at the lower right? Doesn’t this counterbalance, in a clever way, the outward curve of the canister on the far left? Eighteenth-century patrons appreciated Roland de la Porte’s finesse, and loved the beauty of simple objects presented in such a sophisticated manner.